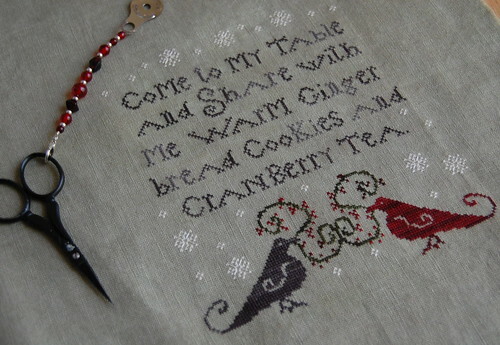 Nicole's Needlework: Christmas Tea Finished! I got this finished up last night. I'm so happy to have it done! I think I may go get some foam core board today and get framed. I'm really in a finishing mood lately! Plum Street Samplers "Christmas Tea"
Now I'm trying to decide what to stitch now... Peppermint Lane, Santa Wants to Know or a Bit of December? Go to my LNS and find something new? :) Nah, I'd better not! Better stick with something I have here. Write soon! That piece looks so beautiful stitched up.. congrats! Can't wait to see the finishing. I really like this pattern...so much more so now that I've seen yours. Beautiful finish and just in time for the holidays! Beautiful finish! I love seeing that piece all stitched up. For some reason, I cannot see the pics, but I did yesterday. I love that pattern and I'm going to have to get it! I'll check back later to see if I can see the pics! I love that chart... it is such a pretty one. I haven't visited in a few days and look how much you've accomplished. It's all looking very beautiful. Love the latest with the two birds. Oooo, I like that. Great, just what I need. the desire to start **Another*** something new. Thanks! Wow, it's gorgeous Nicole, I love it! This one is waiting for me in my stash, you inspire me to get busy on it! I'm voting for Peppermint Lane. I just love peppermint. But especially since I know you will take a gorgeous picture of it. PS. I love your new blog banner!! Just gorgeous Nicole!! Fabulous finish! This is sooo beautiful Nicole! I love the fabric and the threads~~the colors are so beautiful! 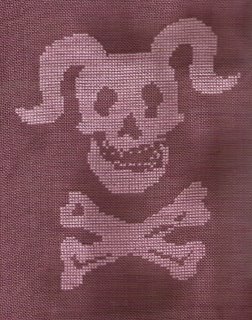 I simply must get this pattern now, lol!!! Oh my! That is so beautiful! Yep, I have to have that one. So cute Nicole! I vote for Peppermint Lane! You go girl! Nicole, can you hear the applause? Wonderful finish! PS I vote for Peppermint Lane! looks great, so what did you decide to stitch next? Beautiful finish! Your pillow is gorgeous too! This looks so beutifull! I love it! Terrific finish Nicole and I like that fabric you've stitched it on. Es realmente precioso!!! te felicito por tu trabajo tienes bellezas !! This is so pretty. Great job! Can't wait to see what you decide to work on next! Oh wow you've finished it!! It is gorgeous! I love the colours.